Why be a sucker for a penny stock with a good story, when you have Immersion, Melco Resorts, and Royal Gold instead? Penny stocks are exciting in a get-rich-quick kind of way. But the risks of something going wrong are huge. The penny stock space is replete with scam artists and small, financially weak companies. So we asked three Motley Fool investors to recommend stocks that are established, yet still quite exciting. If you're considering penny stocks, you might want to step back instead and take a look at Immersion Corporation (NASDAQ:IMMR), Melco Resorts & Entertainment Ltd. (NASDAQ:MLCO), and Royal Gold Inc. (NASDAQ:RGLD). Each of them opens up a huge opportunity, if you take the time to dig in just a little bit, without the risks that often show up with penny stocks. Chuck Saletta (Immersion): People buy penny stocks hoping to get their hands on an undiscovered company before it hits it big. The problem, though, is that there are so many disasters and scam artists among the penny stock crowd that real values are nearly impossible to find. A better way to look for the next big thing is to recognize a key emerging trend, then find a company leading the charge to bring that trend to life. That's where Immersion looks like it has great potential. As a leading company bringing haptics -- the sense of touch -- to electronics, Immersion is well positioned to thrive as virtual reality (VR) takes off thanks to cheaper equipment. After all, to make VR truly immersive, it only makes sense to add touch to the visual and auditory experience. Immersion is expected to return to profitability this year -- and has already shown itself capable of doing so with strong first-quarter results. Trading at about 10 times anticipated forward earnings, and with earnings expected to grow by around 15% annualized over the next five or so years, Immersion even looks like a reasonable value today. With Immersion, you get a real chance to get in on the VR trend before it gets huge. And even if VR doesn't really take off, Immersion's shares look reasonably valued for what it's able to deliver today. That makes it a far better investment than the typical penny stock, where there's very little beyond hope -- or hype -- backing up its shares. Travis Hoium (Melco Resorts): If you're thinking about gambling on penny stocks, you should look instead at betting on gaming stocks like Asian casino giant Melco Resorts. It may not be a household name in the U.S., but Melco Resorts holds a valuable position in the gaming industry as one of just six concessionaires in Macau, the world's biggest gaming market with $35.6 billion in gaming revenue over the past year. That's more than five times the figure for the Las Vegas Strip. Given the sheer scale of Macau's gaming market, it's no wonder Melco Resorts is one of the world's largest gaming companies, with a market cap of $17 billion. What makes Melco Resorts so attractive right now is the $1.14 billion of EBITDA it generated in the past year, a proxy for cash flow generated by a resort or casino. And there's Macau's gaming revenue growth of 22.2% so far this year. That's like a tide that lifts all gaming companies in the region, including Melco Resorts. MLCO EBITDA data by YCharts. TTM = trailing 12 months. What makes Melco Resorts different from most gaming companies is that it's not weighed down by a large debt load. 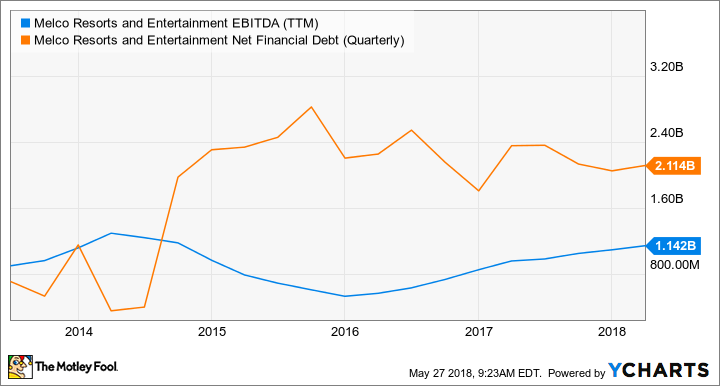 You can see above that the net debt of $2.1 billion is less than two times EBITDA, which is a very manageable level for the company. "We believe our focus on the Asian premium segment, high-quality assets, craftsmanship, dedication to world-class entertainment offering, market-leading social safeguards system, and commitment to being an ideal partner will put Melco in a strong position to help Macau-Japan to realize the vision of developing world-leading [integrated resorts] with a unique Japanese touch." With a profitable foundation in Macau, low debt, and the potential to win a gaming concession in Japan, Melco Resorts is a strong bet in the gaming market, and it's a much better gamble than penny stocks. Reuben Gregg Brewer (Royal Gold Inc.): Upstart gold miners are frequently found in penny stock land. This makes sense: Tiny miners often have little more than land that they think they can turn into a gold mine when they start looking for funding. If their golden dreams come true, investors can make a lot of money. But if that mine doesn't work out, investors will lose their shirts. A better way to invest in such upstart gold mines is Royal Gold Inc.
Royal Gold is a royalty and streaming company with a diversified portfolio of mine investments. It currently has investments in 39 operating mines, which provide cash flow to support operations, future investments, and dividends to investors. (Note that the company has increased its dividend for 17 consecutive years -- an impressive record in the highly volatile commodity space.) In addition to this, it has another 22 mines under development, and 131 investments in projects that are in a pre-development stage. 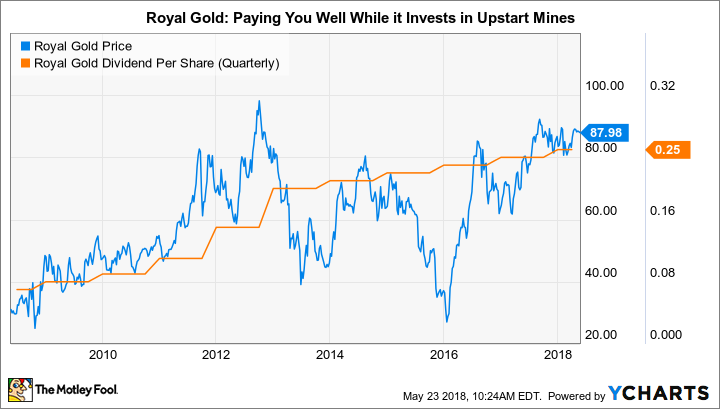 So instead of betting it all on one penny-stock gold miner looking to strike it big, you can buy Royal Gold and get exposure to more than 150 mines in some stage of development. Sure, the payday won't be as big, but the risk isn't as big, either. And don't forget that Royal Gold's business is to vet the potential of mining projects, so those 150 investments have been screened by gold mining pros. A steadily growing dividend backed by operating mines, a diversified portfolio of development projects, and an experienced management team: All that sounds way better to me than a penny stock. Sure, you could try to find investment ideas in penny stocks. But you'll be left doing a huge amount of research and, in the end, you'll still likely be doing little more than praying that you don't get scammed, or that you don't watch your savings get wiped out by a tiny company that just couldn't compete. That's why a well-positioned tech name like Immersion, at the cutting edge of VR, is such an interesting idea; and gaming giant Melco, as it looks to tap into a potentially gigantic new market; or even Royal Gold, which does the legwork for you by vetting tiny gold mine investments. If you are about to buy a penny stock, why not stop and take a look at this trio of stocks instead?